Designated as a guardian shrine for Byodo-in during the Heian Period, the shrine attracted worshippers among the local residents, and the shrine buildings were carefully maintained. The Honden is of an unusual design: it consists of three inner shrine buildings built side-by-side in the nagare-zukuri style, each measuring one day across, with a sweeping nagare-zukuri roof covering them all. Because of certain details of workmanship in the entablature, it is believed to have been constructed in the late Heian Period, and is the oldest extant Shinto main shrine building. 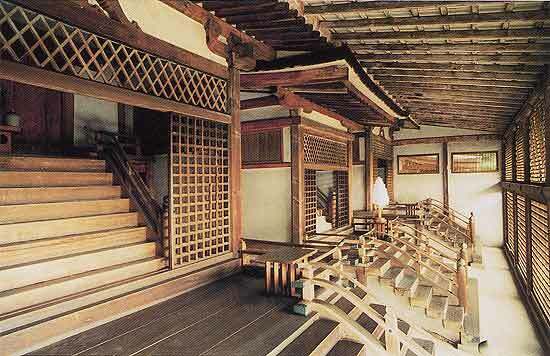 The Haiden, built in the Kamakura Period, is older than any other extant Shinto worship halls as well. 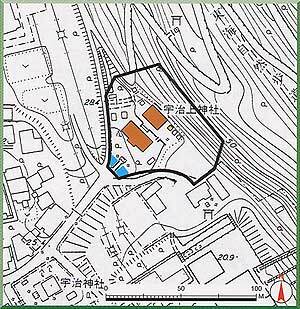 It is destinguished by its residential-style design, with the hisasi (narrow, roofed areas) appened to the right and left of the kirizuma-style moya (inner area), with the hisasi roofs forming leaning gables (sugaru hafu). In contrast to the Honden which enshrines the deity, the Haiden is intended for the use of human begins, for this reason it was built in a residential style. It is believed that this Haiden was built using the airy, buoyant techniques of the shinden-zukuri style which represented contemporary residential architecture at the time of its original construction and that those techniques were passed down in the reconstruction in the Kamakura Period.